I’m pleased to announce that we have launced the SC Speed Team. This team will be lead by Special Constable Paul Jenkins and will be responsible for carrying out speeding enforcement in your community. As part of an on going campaign to tackle shed and outbuilding burglaries in South Cambridgeshire officers have completed an initiative together with crime fighting charity Crimestoppers to reduce shed burglary, and gain specific intelligence about this crime, and the handling of stolen goods, those who make contact through Crimestoppers may receive a cash reward. The campaign was launched on Wednesday 6 June at Morrison’s supermarket in Cambourne. A large advertising van visited key locations at Supermarkets in Bar Hill, Cambourne, and Fulbourn. The van also toured South Cambridgeshire villages where shed burglaries had occurred. 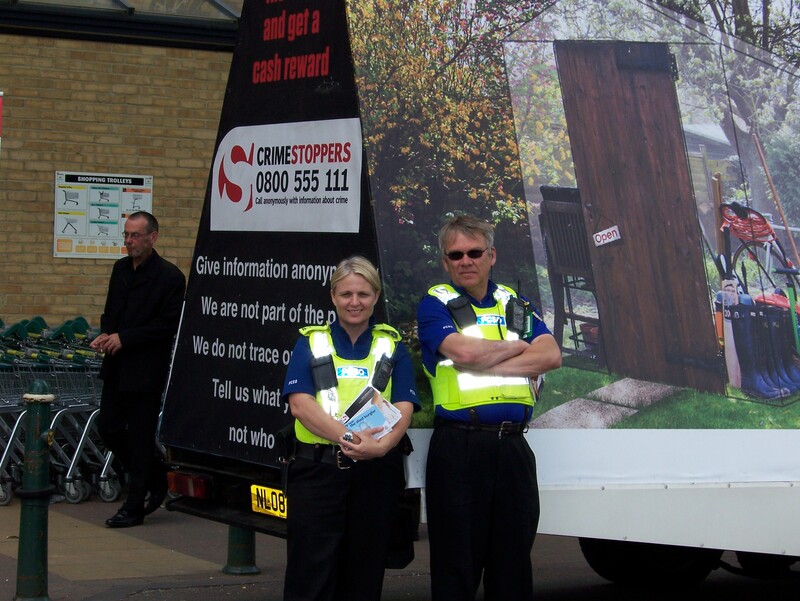 Crimestoppers volunteers and Police staff gave out information and advice about the campaign. 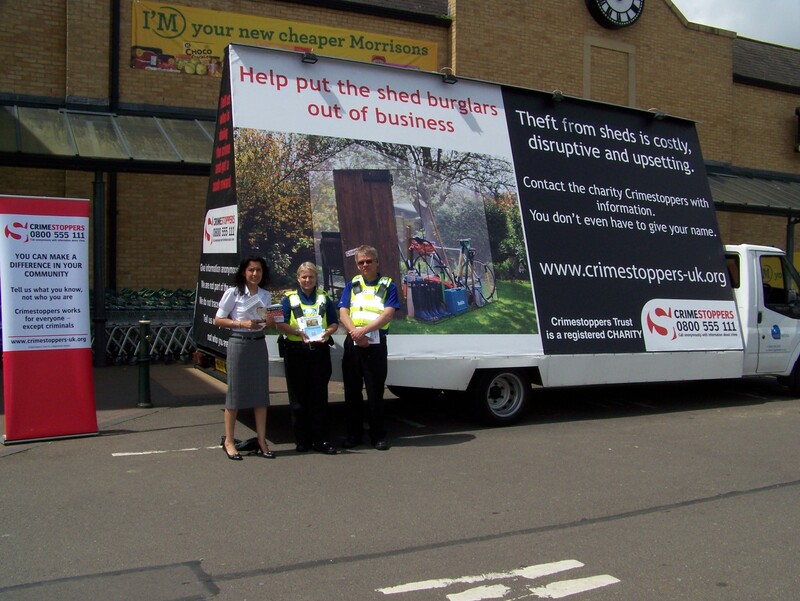 The main aim was to increase awareness about shed security and property registration, as well as asking for intelligence and information using the confidential service that Crimestoppers provide. We were delighted with the response we received from local residents, hundreds of people took the information and security advice away with them, with some people making contact for more detailed advice and support; and residents were made aware that if they have information about criminal activity they can give information anonymously to Crimestoppers. Rob Needle, Chairman of Crimestoppers said: “Having your shed burgled can be costly, disruptive and upsetting. Being burgled is not just about losing possessions, it also robs you of feeling safe in your own home. No one has anything to fear by contacting Crimestoppers as you will remain anonymous – no personal information is ever taken. Calls are not traced or recorded and you do not have to go to court or give a statement to the Police. In the 25 years plus that Crimestoppers has been running we have never broken our promise of anonymity”. BUSINESS owners are being urged to be vigilant after 14 firms were broken into across South Cambridgeshire. Offenders targeted tills and petty cash trays at businesses premises across Papworth, Sawston, Cambourne, Swavesey, Bourn and Milton overnight. Burglars forced their way in through doors or smashing through windows. 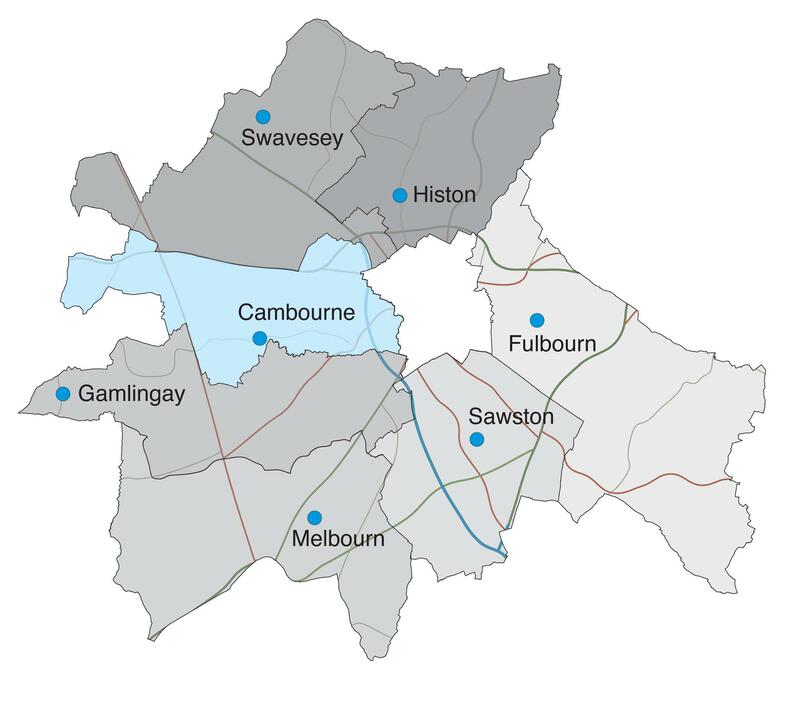 South Cambs Business Watch Officer, Carly Freed said: “We would ask business owners to be vigilant and ensure the security of their business when they leave at night. Anyone with any information should call Detective Sergeant Sarah Gaylor on 101 or Crimestoppers, anonymously, on 0800 555 111.